Brands clearly distinguish you from your competitors. They represent a promise to your customers that you will deliver something unique and special. We have extensive experience in the hospitality industry working for clients big and small. At Purple we offer independent hotels and smaller hotel groups the expertise to build their brands so that they can reap the benefits that a successful brand delivers. An established and respected hotel brand means that you can charge more for your rooms and other services. A recognised hotel brand means that you can charge more for your rooms and other services. We estimate that the bottom-line financial value of building a brand that guests trust is between 10% and 25% above that of ‘unbranded’ hotels. Great brands offer wonderful guest experiences so that guests come back and generate positive word of mouth (esp through Social Media). There’s no stronger recommendation than that of those you know and trust. A trusted brand – encapsulated in its Brand Spirit - inspires and engages your staff which means they work with greater enthusiasm, providing higher levels of service. What really distinguishes us is our ability to take your brand through into the practical applications of Market Positioning, Marketing and Communications Planning and the successful exploitation of Online and Offline Marketing Channels and Communications. Brand Purpose & Positioning (igniting your hotel's Brand Heartbeat). Defining your hotel's Signature Service Style. Expert Service Assessments (your hotel and competitors). Mystery Guest Assessments and Programmes. Monitoring and responding to Trip Advisor and other OTA guest assessments. Online and Social Media Management to make sure they get you the best results. Discovering your hotel’s Unique Selling Points (USPs). What really makes you SPECIAL? Inspiring a winning Sales & Marketing Team (using Appreciative Inquiry). What if you could identify additional sources of revenue for your business and create a plan to access them? We've created a unique Revenue Builder Programme to help hospitality clients build additional revenue - both through short-term actions and longer-term marketing and branding activities. Based on our experience in the hospitality industry we have created a Hospitality Revenue Map – which identifies the complete set of revenue building opportunities for hotels, restaurants and spas. Review all you revenue generating operations. Identify ways of increasing revenue from existing sources as well as NEW revenue building opportunities. Create a Revenue Building Plan to achieve your revenue targets. Coach you and your staff as you implement the plan - with monthly reviews and enhancements. Achieve additional revenue from existing sources. Build revenue from new sources. Do all this in a way which builds your brand image and presence in the market place. In-House Revenue Building Workshop - with your management team - to create the Revenue Builder Plan. Coaching of your team to implement the plan and monitor results. Attend one of our group workshops and learn the basics of the Revenue Builder Programme. Overview of the Revenue Builder Programme. How to create your own Revenue Builder Plan. Online support as you build and implement your plan. Thank you. We will be back to you within 24 hours. We undertake a rapid review of your business and make recommendations for revenue and efficiency improvements. Review of your financial performance. Mystery customer/guest reviews to determine your current guest experience. Report: A series of detailed, action-oriented recommendations to improve the performance of your hotel. Brand Definition and Service Theme. Staff Handbook and Engagement Programme. This unique workshop is run with your heads of department. We map out the complete guest journey to explore opportunities to deliver magical experiences to your guests. It doesn’t matter what class of hotel you run – magical ideas apply across the board and are an effective way of building guest loyalty. We work with you to explore how both room and non-room revenue can be maximised. Review of current revenue sources and margins. Recommendations for cross-selling and up-selling. How to enhance your customer/guest experience and increase prices. Defining and delivering your hotel’s brand (and signature service style). Services need to be designed with the same rigour and care as a highly engineered product, with nothing left to chance. We specialise in the design and enhancement of service experiences throughout the customer journey. Originating from work with such leading services businesses as Virgin Atlantic Airways, QANTAS, Emirates and Ritz-Carlton Hotels, our expertise spans all aspects of service sector marketing and branding. We start by mapping out your current Customer Journey and the Experience at each point. Where are your service high-points and vulnerabilities? How do you perform in a market/competitive context? What insights can we distil to identify new opportunities for service improvements or enhancements to position you effectively against your competitors? We work closely with you to redesign your services so that they offer the customer a meaningful experience with clear bottom-line benefits for you. Purple is a member of Practical Service Design - a network of over 2,000 service design specialists. This gives us the support of some of the brightest minds on this important topic. We examine your Brand Experience holistically. It includes both the traditional components such as its brand identity and packaging as well as the design of products and services themselves, as well as retail and service environments and front-line service encounters. See this in terms of the customer journey and all sorts of new opportunities to offer a better brand experience will emerge. Delivering service that encapsulates your Brand Heartbeat is fundamental to creating the right Brand Experience. We work with you map out your customer journey and define your Brand Experience and create your Signature Service Style successfully uniting all the expressions of your brand. We work with digital specialists who ensure that every user experience and customer experience are in sync. 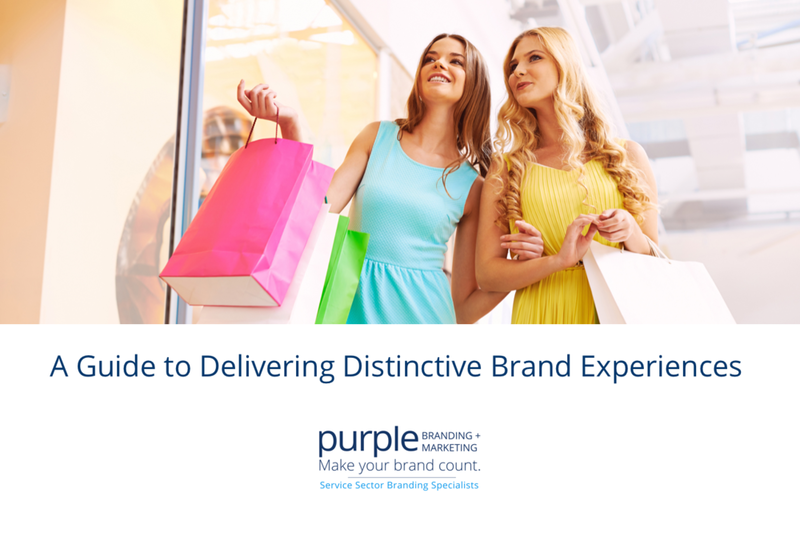 Get your FREE copy of Purple's Guide to Creating Distinctive Brand Experiences. Simply let us have your name and e-mail and we will e-mail you a copy of the Purple Guide to Delivering Distinctive Brand Experiences.